Get more from your QuickBooks®, Quicken®, or Microsoft® Money program and save up to 80% on your checks! 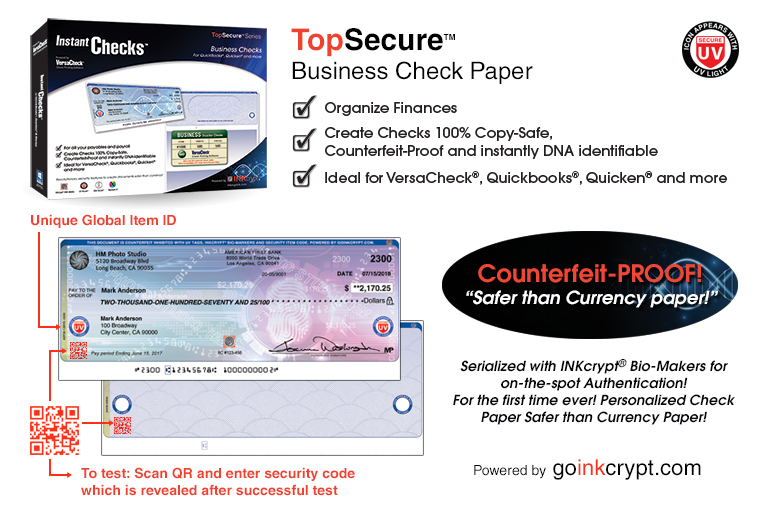 Everything you need is included in this great bundle so you can start printing your own checks using economical blank check paper. Quality, bank-compliant check paper. Simple set-up with VersaCheck Presto software that works seamlessly with your current accounting program and printer. 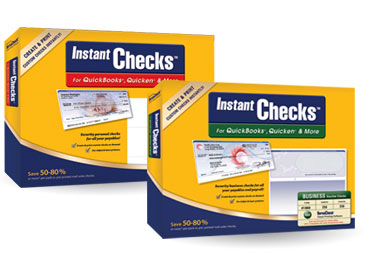 Choose the Instant Checks Package that works for you! 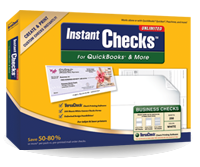 Includes everything you need to print checks instantly! Form 1000 for use with all VersaCheck software products (except Silver version). Please specify color when ordering: Blue or Green. 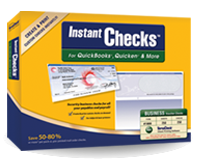 Compatible with: Quicken, QuickBooks, MS Money, MAS90, MYOB, MY Checkbook, etc. Each sheet has three business-size checks on the page, micro-perforated at 3.5", 7" and 10.5". Form 3000 for use with all VersaCheck software products (except Silver version). 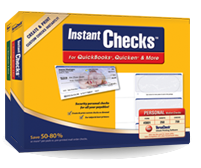 Compatible with: Quicken, QuickBooks, MS Money, VersaCheck, Simply Money and more. 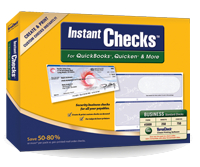 QuickBooks®, Quicken®, VersaCheck®, Microsoft® Small Business Accounting & many more! Form 3001 for use with all VersaCheck software products. Three personal-size checks with stubs to the left of each check.